It is not illegal for civilians to fight back against an occupying army. It was not illegal for French, Greek etc people to form resistances and fight back against Nazi occupation. Nessie the occupying army decree the laws: where on earth do you think laws come from? God? There is no international police, no real international law: the law is the occupying power which obviously over rides the previous law of the land. If the occupying power decree it is illegal to form resistance and a capital offence that is the law. But Nessie, in the Ambrose Bierce story, Mr. Peyton Farquhar learned otherwise, didn't he. And if we are specific to France, is it before or after the 1940 Armistice--or does it even matter to your argument, Nessie? It could be argued that Dirlewanger or (more on point) Kaminski were themselves brigands or freebooters like the Blackwater company, so that is probably not relevant to an overall question about whether anti-Partisan warfare is inherently illegitimate, let alone Genocidal. The Einsatzgruppen were basically operating under OKW authority and are another complicated subject, but even outright preemptive assassination of enemy cadre like the Commissar Order, drone strikes, or the Phoenix Project during in the Vietnam War can be justified on legitimate military grounds. And Omer Bartov might think otherwise, but Not everything about World War II was just Hitler and the Joos. This debate was very short notice and it got very personal and weird, I suppose. Mr. Hunt seems to have skedaddled now and I don't recall anyone ever asking me to close the thread. The goalposts are being shifted, since there is no international law as you previously suggested. But, lets go with Nazi laws. Link to and quote the laws the Nazis introduced which made civilians fighting back illegal. "During the night, exchange of heavy fire between Lithuanian insurgents, Jews, and irregulars. Very difficult to secure the prisons, which are totally overcrowded. During the last 3 days Lithuanian partisan groups have already killed several thousand Jews." "In the period August 25 to September 9, 1941, 595 persons were executed. This number is composed of Jews, Communists officials, members of the JBV, and dangerous mentally ill persons." "In Minsk, another 21 persons, who spread anti-German agitation by whispering propaganda among the population, were liquidated"
"A Jew was shot in public in the Baranovichi Ghetto because he refused to work"
I realize that in Western countries they tend to romanticize and glorify francs-tireurs, but in other countries this is not the case. Try being in a French colonial country like Viet-Nam or Algeria after World War II and being a local who just got caught taking a pot-shot at French Foreign Legion troops. You would be lucky if they treated you better than the Germans would have or the Americans would today. You keep wanting an International Law citation but "International Law" is somewhat unclear at best and is not based on "LAW" in any sense but upon treaty interpretations, as I said. I guess that Westerners are so used to seeing the Krauts depicted as the Bad Guys that you can do anything you want to their soldiers and be considering a fücking hero of some kind. That is a cringe-worthy way of thinking at best. The new requirements on PoW status were beefed up a bit after WWII (Geneva, 1949, etc.) -- not that it really matters, however, unless you are not a Superpower state that also loses a war unconditionally. 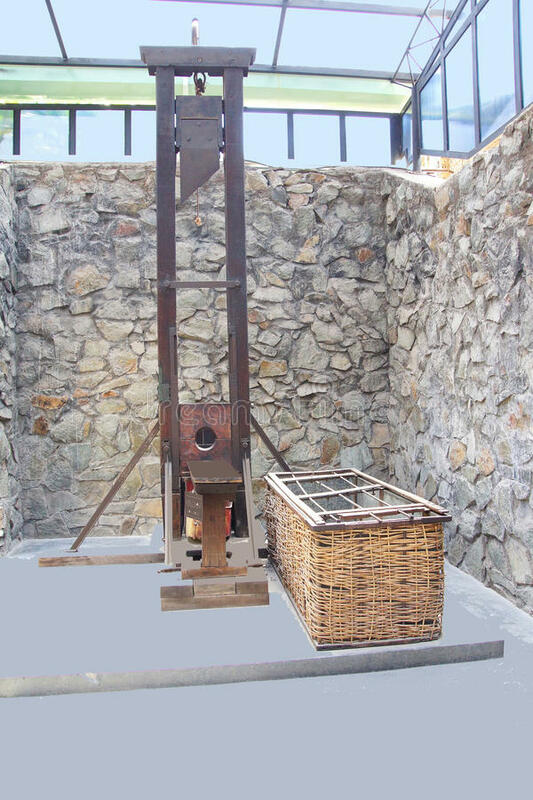 The French in their Colonies did not have firing squads but continued to use the Judicial beheading device. The machine below was used extensively in Vietnam Saigon against partisans. Over 1,000 accused revolutionaries stood trial for the Yen Bai mutiny, and the top leadership paid the top penalty this date — but as quietly as the French could manage. 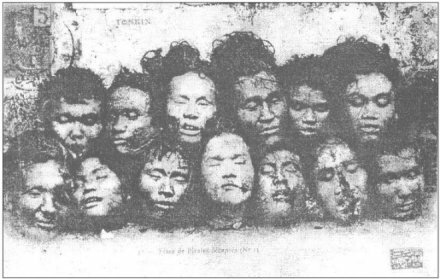 They were whisked out of their cells on the preceding evening and taken by secret convoy on a four-hour ride to the Yen Bai execution grounds, where a guillotine had been covertly erected. That Guillotine took a thousand heads in that single mass execution alone. America supported South Vietnam when the regime guillotined prisoners from 1956 to 1960 and the gruesome contraption is now still on display, its heavy metal blade locked in position, ready to drop. Rusting in Ho Chi Minh City's humid, tropical air, the guillotine was imported to Vietnam by French colonialists in the early 20th century. Another guillotine, also abandoned by the defeated French, is in Vietnam's capital, Hanoi. Thanks for this. I had absolutely zero knowledge about France's headchopping activities in Vietnam during the 1950's, nor of America's tacit support of it. France was famous for use of the guillotine, its last use was 1977, in France and the death penalty was abolished in 1981.